Satirical cartoonist Gerald Scarfe nominates Walt Disney in this weeks episode of Great Lives to be broadcast at 4.30pm on Tuesday 28th September on BBC Radio 4. Gerald Scarfe spent much of his childhood in his sick bed, so it’s not surprising that Disney cartoons and feature films meant so much to him. He can still recall the thrill at the prospect of seeing Pinocchio at the cinema, and then the agony of being lead away again in the rain because the tickets were too expensive. Walt Disney came from a working family. His god-fearing father Elias, said by one writer to have ‘hated Capital, and favoured Labour, but really needed to make a buck’, found work where he could. So Walt lived a peripatetic childhood, and sought solace in drawing and play acting. Hard times early on did not make Walt frugal with money in adulthood, and despite the huge successes of the golden era of Disney, it was only with the opening of Disneyland that Walt attained any substantial personal wealth. 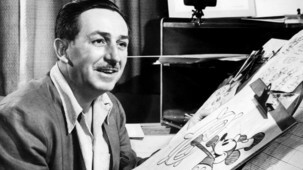 You don’t have to look far to find myth surrounding Walt Disney. Even after his death, rumours that his body had been cryogenically frozen spread so widely that they soon slipped into folklore. He had actually been cremated, but the readiness with which the cryogenic claim was accepted perhaps bears witness to a man who was terrified of dying, who believed in the white hope of technology and who, some might say, had been searching all his life for an escape into an immortal, fairytale world. Scarfe himself is best known for his classic images lampooning the great and the good of politics, and also in his iconic animation for Pink Floyd’s The Wall. He reveals in this programme that he also spent time working on the Disney production Hercules. BBC Radio 4 will be broadcasting this show again at 11pm on Friday 1st October 2010.